Turkey is a peculiar country where Anatolian, Occidental and Middle-Eastern influences have been concurrently effective in politics, economy, and, especially, in culture. Due to this, the state, however democratic it claimed to be, has always been an authoritative figure in arts and culture. Censorships, oppression, and jail threats for filmmakers, musicians, writers and caricaturists are not rare incidents in the country’s political history. Yet, at the same time, although a number of activist animated shorts are being watched by millions of people on the Internet, animation has not been much of a field of debate, probably because it was never taken too seriously by the authorities or by the spectators. Instead, the government perceived it as a useful tool for education or for promoting the good values of Turkish & Islamic folklore. In the 1980s most of the TV shows sponsored by TRT, the National Broadcasting Agency of Turkey, were interpreting characters from Ottoman and Turkish history. 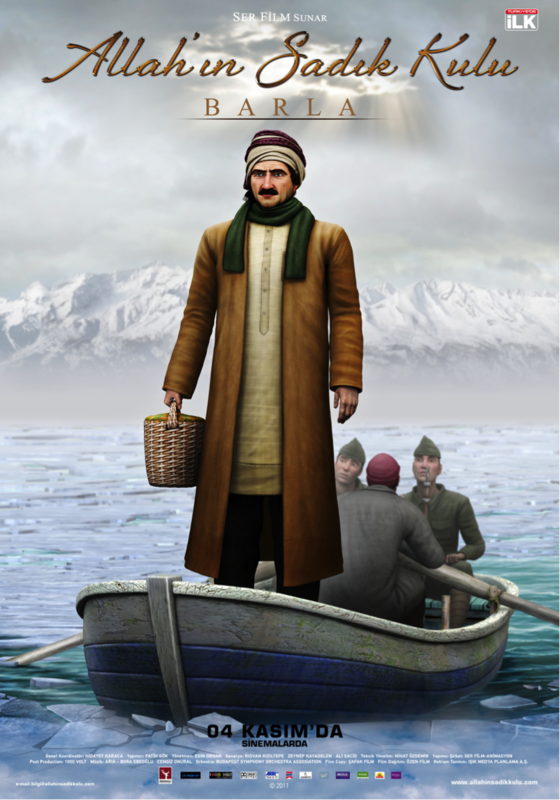 In this post, I want to provide an account of the factors that were effective in the production and the distribution process of the “most watched” Turkish feature animated film: Allah’ın Sadık Kulu: Barla (The Loyal Servant of God: Barla, 2011, by Esin Orhan). The first striking aspect of this film is its success at the box office, which was over 5 times bigger than that of other popular animated features (see figure 1). Figure 1. 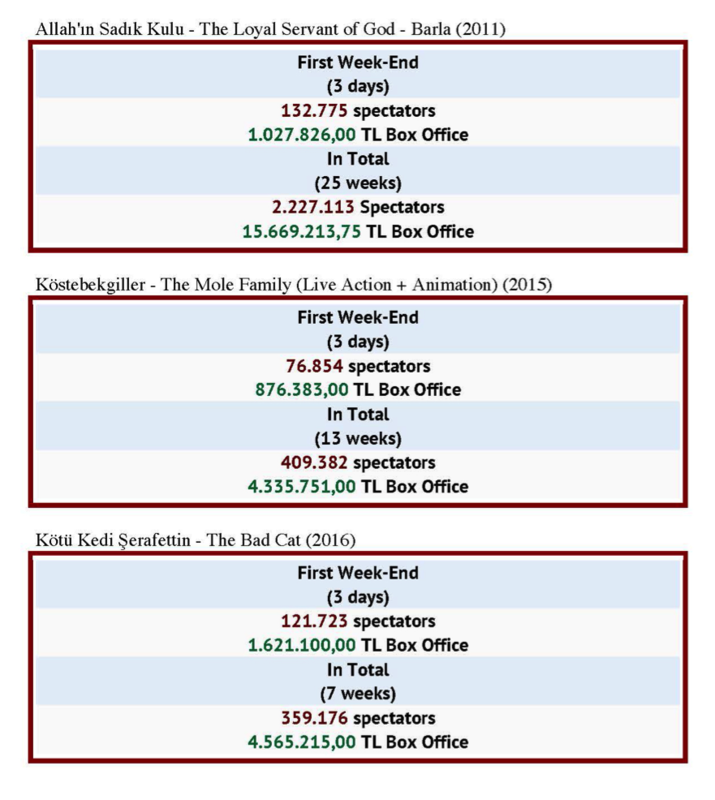 The Box Office numbers of Loyal Servant of God, Barla compared to those of two other popular Turkish animated features. However, these numbers cannot be interpreted as a direct indication of the popularity of this film among spectators. It is rather a result of an advertising campaign involving a wide spread media network and of unusual “distribution techniques”, such as obligatory school excursions to the screenings and free tickets handed out in work environments. On Eksi Sözlük, one of the largest online communities of Turkey, many users state that they have been offered up to three tickets for this film in various situations, and most of them did not watch the film. On the same platform it took place also a lively debate about the main character, Said Nursi, and can be found some (mostly negative) comments on the animation technique and cinematography of the film. Figure 2. The poster of Loyal Servant of God: Barla. The film tells the story of Said Nursi, an Islamic figure active during the first half of 20th century in Turkey. He inspired a faith movement called “Nurcu”, of which Gulen movement was part. As one might recall, Gulen movement has played a vital role in the revival of political Islam in Turkey in collaboration with AKP, the party in power, and it is now deemed a terrorist organization by the government. The film concentrates on the period where Said Nursi was exiled to a small town of Turkey during the 1930s for his political activities. Prior to working on The Loyal Servant of God: Barla, Esin Orhan, the director of the film, had been directing children’s show on TV, and had no experience with either animation or feature films. She reported that, as a team, they wanted to reach a level of realism in this film in order to revive the “Master” as truthfully possible, so they modeled the character in reference to his pictures and opted for the motion capture technique, in order to not “open up possible discussions” about the way he moves. She also noted that the script was already conceived when she was “put in charge” and they just wanted to visualize it in the best way they could (see Haber 2011). Figure 3. An example of the film’s lack of detail in modeling and stiff animations. Although Orhan stated that she was satisfied with the result –after admitting that they had a lot of technical issues in the making of–, the film was criticized because of its poor cinematographic quality, its lack of detail in modeling, its rather stiff animations and the unconvincing facial expressions of characters. For me, this suggests that the animation part of the film was considered a technical process to be completed as fast as possible in order to spread the message, and the emphasis was put on the distribution process rather than on the quality of the production. There’s nothing new in the choice of recounting the life story of a political figure through animation, nor to take a political stance in an animated feature, but when the mechanics of propaganda overshadow the storytelling and the internal mechanics of animation, these films disappear in oblivion regardless of how many people watch them. Turkey is not short of this kind of films that take advantage of distribution networks, but fortunately, there exist also better examples produced and distributed in conglomerate economic and artistic conditions such as Bad Cat (2016, by Mehmet Kurtuluş and Ayşe Ünal) or the upcoming Rafadan Tayfa (2017). Haber, G. (2011) “Allah in Sadik Kulu: Barla Filminin Hikayesi,” NurNet.org. Zeynep Akçay is a scholar and animated filmmaker experimenting in various fields of audio-visual narratives. She was born in Turkey and studied Communication in Istanbul before moving to Canada to get a BFA degree in Animation at Concordia University. She continued her studies completing a MA in Film Studies, for which she wrote a thesis about the narrative strategies in animated films. She also worked in several commercial projects, including two TV shows and a stop motion film. Upon her return to Turkey, she worked in production companies and continued teaching animation as part time lecturer until her appointment as full time lecturer at Yaşar University in İzmir. Here, she is currently working as lecturer in the Animation Department and finalizing her Practice Based PhD.